The buildings on both corners of Mitchell Street were originally pubs, dating from the mid-nineteenth century. Number 92 retains the original appearance. At number 90, a supermarket rendered in Art Deco style covers the remains of an old stone inn, The Currency Lass, dating from 1858. On the opposite corner, at 92, the former Waratah Hotel dates form the 1860s. 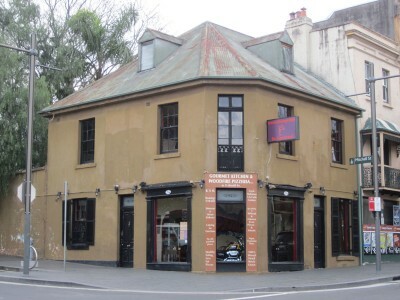 The building has undergone little alteration and is one of the earliest, most intact two storey corner buildings in Glebe Point Road. Until 1881, pubs were open from 6am to midnight, seven days a week. The Temperance movement, drawing its fervour from evangelical religions, was successful in making Sunday trading illegal following the Liquor Act of 1882. The result was that drinkers bought more bottled beer to see them through the weekend, though gradually most pubs opened illegally on Sunday – according to police estimates in 1900, 80 percent of them.